This past week in Melbourne has been full of activity as I had a chance to take part in some events that, every time I’m in Australia, I seem to always find myself attending. Of course, as you probably can guess, none of these events were Music Festivals or any other event that involved camping, yet they were all events that have played a significant role in every one of my visits to this city over the years. 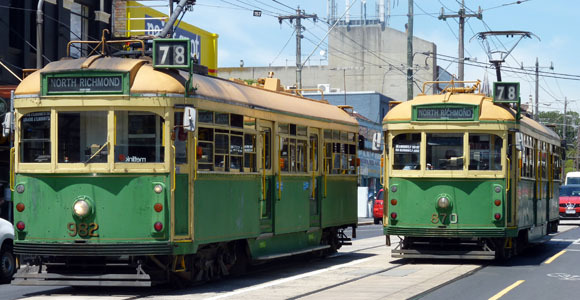 Without them, summer in Melbourne just wouldn’t be summer in Melbourne. At $29, a daily ground pass to the Australian Open offers what I think is quite a good deal, one that I always take advantage of if I’m in Melbourne when the tournament rolls around in mid-January. With this pass, one is allowed to spend an entire day watching any of the tennis matches taking place on any of the 22 outdoor courts, including the stadium-style “Show Court 2” and “Show Court 3” as well as the even larger “Margaret Court Arena”. While you’re not allowed to enter the two indoor arenas – HiSense Arena and the center court in Rod Laver Arena – where tennis’ biggest stars tend to play, there’s definitely no shortage of good players to watch outside. This year, I went to the Australian Open towards the end of the first week and despite the high temperatures, blazing sun and complete lack of shade (ie. Australian sunburn), the outing was perfect. I stayed for over 8 hours, watching both singles and doubles matches that involved such players as David Ferrer, Marin Cilic, Marcos Baghdatis, Maria Kirilenko (don’t worry, I had never heard of her before either), Santiago Giraldo (or him), Lucie Safarova (or her) and an extraordinary amount of women players from the Czech Republic, including, and not limited to, Benesova, Strycova, Ondraskova, Peschke, Hlavackova, Hradecka, Kvitova and Zakopalova. Surprisingly, and unlike previous years I’ve attended, there were never any problems finding good seats, even in the more popular Margaret Court Arena when it was time to watch the evening match between Andy Murray and another guy. Ok, hold on, I’ll look it up. The other guy was Illya Marchenko from Ukraine. And unlike other tennis events, from what I’ve heard, the atmosphere at the Australian Open is somewhat, well, different. With endless beer and wine gardens and fans dressed up in elaborate costumes while chanting such slogans as “If you’re Aussie and you know it, clap your hands”, the vibe resembles that of a circus at times, but a good circus. In fact, such a good circus that I’ll keep on returning to it every time I visit Melbourne. Every year, on January 26th, Australians around the country celebrate Australia Day, a national holiday to commemorate the arrival of the “First Fleet of 11 convict ships from Great Britain, and the raising of the Union Jack at Sydney Cove by its commander Captain Arthur Phillip, in 1788” (History of Australia Day). And typically, on this day, no matter where you live in this vast country, there are endless celebrations, festivals and events taking place. The Australia Day brochure for Melbourne alone this year included over 40 special events, ranging from free breakfasts to parades to musical performances and special museum exhibits, with something interesting to do every single minute of the day. However, as is the case every single time that I am in Melbourne for this holiday, I actually didn’t attend a single event or participate in a single one of the official celebrations. The reason is that one of my long-time friends from Melbourne happens to be one of the several thousand Australians whose birthday falls on Australia Day. And so, every single year since 2000, this friend has invited people to his house for a large BBQ in order to celebrate both events. To my circle of friends in Melbourne, Justin’s BBQ is an event that remains permanently etched on their calendars and without a real good excuse, is never to be missed. Three days ago, with all of the ingredients to prepare the perfect sangria stuffed into my backpack, I hopped on the tram at around 1pm and rode out to Justin’s house, where I was greeted by a large group of people who were already into their third drink. This group included many familiar faces, mostly friends from my Uni days whom I hadn’t seen since my last visit two years ago, as well as a handful of people I had never met before. The grill was fired up, the sangria was prepared and just as I expected, the afternoon passed by as enjoyably as I have come to expect from these BBQs, with a combination of conversation and laughter that made me feel as if I had been living in Melbourne, surrounded by these friends, for the past 10 years straight. Finally, I come to the third event of my Australian summer…the cricket. Not only am I talking about attending a cricket match, but I’m talking about attending a cricket match at the MCG, the Melbourne Cricket Ground, Australia’s most famous stadium. A friend of mine works for the Victorian Cricket Association and as a result, had access to free tickets for yesterday’s evening match between Victoria and South Australia. And as I entered the massive stadium and glanced around at the well-manicured cricket pitch (field) and at the rows of seats rising high into the sky, I again felt as if I’d been coming here to watch sporting events for years. We settled into our seats and within minutes the match began. 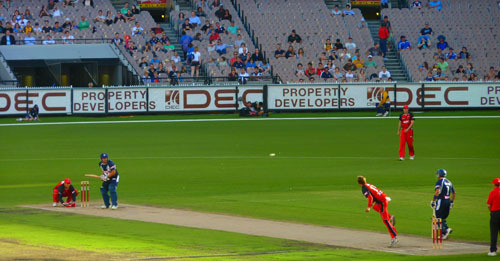 Of course, this wasn’t an international match which is normally attended by over 100,000 insanely devout cricket fans. Instead, yesterday’s match was attended by 10,000 or so relatively subdued fans, who, despite attempting the Mexican wave on two occasions, lacked that intense energy often present when the Australian team plays England. 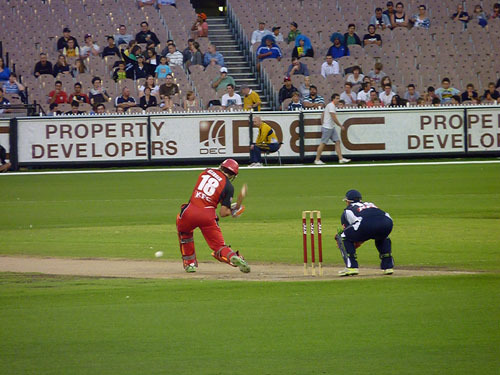 For those of you familiar with cricket, the match yesterday was a Twenty20 match and South Australia managed to escape with a victory when Daniel Christian hit a four during the final over. For those of you not familiar with cricket, South Australia won when a guy hit the ball pretty far just before the end of the match. So that is a typical summer week in Melbourne, and if you can find a good price on Australia flights, it’s the kind of week that anyone could experience. I’ve now been fortunate enough to experience such weeks during every visit to this city over the past 12 years. And now that I’ve done so this time around, it is time for me to move on. I’m off to the Great Ocean Road this week for five days and then to the Barossa Valley wine region the following week, located near the South Australian city of Adelaide. Any cricket fans out there? Or tennis fans? Earl, Sounds like a great trip. I was blown away by the price for a day pass at the Australian Open. Might be on of the great bargains for any trip. Even though I am a tennis nut, I think the BBQ and sangria sounds like more fun than the Open. Hey Dave – The Australian Open day pass is definitely a bargain, especially if you attend during one of the first three days when there are plenty of stars playing on the outdoor courts. But like you, if I had to choose, the BBQ would probably be my first choice in the end as well! What a busy week, sounds like a lot of fun! Hey Sofia – I never understood it either until one day it all just clicked and while I’m not expert, my (very) basic knowledge has made the game considerably more enjoyable to watch! I am a big tennis fan, but never was in Melbourne during the Australian Open. It’s really cool that you were able to go for a whole day and see all those matches. I find that going to a sporting event is always quite cheap in Oz, compared to the UK, where you pay far more for a ticket. I am also a big cricket fan and have spent many an hour at the MCG (including the Ashes boxing day test of 94-95, where Shane Warne made a hattrick!). It’s such a great staduim to be in and always has a nice atmosphere, whether watching an international 5-day test match, or one-day national matches, or even a local match (for which I was actually allowed to sit in the pavilion). Great thing is that one winter, I went to an Aussie rules football match at the MCG, which was then totally packed. It was a really weird experience to see anything else played at the MCG but cricket, but cool at the same time. And great that you ‘bumped’ into Venus Williams. She can be very scary when she’s angry, so I don’t blame you for not talking to her. Hey Maria – Ticket prices are quite cheap here for sporting events. Apart from the tennis, a ticket to the cricket (national matches) is only $15 and you can sit wherever you want once inside the MCG. The Aussie rules matches are excellent, mostly for the atmosphere as well. Unfortunately I’ll be long gone this time once the season rolls around. Some great outdoor activities and reasons for celebration for sure. I can’t stop laughing from the “side note” abut Venus Williams. That’s hilarious man! I’ve only attended 1 cricket match in my life, I was with some friends in Kenya and it was quite a relaxing time…and we ate Indian food! @migrationology: Any sporting event (or any event for that matter) is automatically and infinitely better when Indian food is involved. I could even watch a five day cricket match if there was some korma to eat all day long! All things we are missing in Melbourne…how cool that you got free cricket tickets! The MCG is such an awesome ground. Hey Andrea – The MCG is quite a stadium and I’m still not even able to pinpoint what makes it stand out from other stadiums. It’s just different somehow. And if you’re missing these things in Melbourne, just think of how great it will be the next time you’re here! Hey Kieron – That’s funny because my friends pointed out a section in the stands at the cricket where there was a constant security presence. They told me that was the ‘rowdier’ section, but I guess during the match I went to nothing happened like what was in the video you attached! And this heat is perfect for me. I wish it was 40 degrees every day of the year! What a fun week! Awww you’re headed to 2 of my fave parts of Oz. Have the best time!!! It’s really cool you are in Australia for the Australian day! The last year it was fun for me and Ryan. Great that you watch the cricket at MCG. We heard so much thing about it, huge deal in Australia. We are not kind of sporty people, so we didn’t chase for it. Btw, where are you now? Melb or Syd? I hope you already had the chance to meet up with the flying foxes! Hey Dina – It’s never really crossed my mind to attend a lacrosse match and so I have not seen one yet. I would not have guessed it would be as exciting as you describe so perhaps I need to see one for myself. Seems like that’s an interesting ticket deal that Ryan signed up for. I wish more cities had something like that going on! Hey Anthony – The Australian Open is quite a good deal I’d say. For that $29 you could spend 12 hours inside and catch a ton of tennis in one day. And I will agree with both you and Natalie as well in regards to not striking up a conversation with an upset Venus! The BBQ on Australia day does it for me. I have read other stories about BBQ’s on the beach, cold tins of beer, nice big steak and the sun shining down. Not really a tennis or cricket fan so I would leave that to the other half. Can not believe you did not speak to Venus Williams. Mind you, I would not take her on if she was in a bad mood. She looks mean! !